President Trump moved to commit political suicide today by agreeing to sign a clean amnesty bill, though he appeared to have backed off his statements later on Twitter after Ann Coulter and others let him have it. New York Times best-selling author and populist conservative columnist Ann Coulter says "nothing" in Michael Wolff's recent salacious book Fire and Fury could "hurt" President Trump as much as his�statement on Tuesday that an amnesty for illegal aliens will be a "bill of love." During a meeting at the White House on giving amnesty to nearly 800,000 illegal aliens shielded from deportation by the President Obama-created Deferred Action for Childhood Arrivals (DACA) program, Trump called an amnesty deal a "bill of love" for illegal aliens. "This should be a bill of love, truly. It should be a bill of love, and we can do that," Trump said. "I really do believe Democrat and Republican, the people sitting in this room, really want to get something done," Trump said. 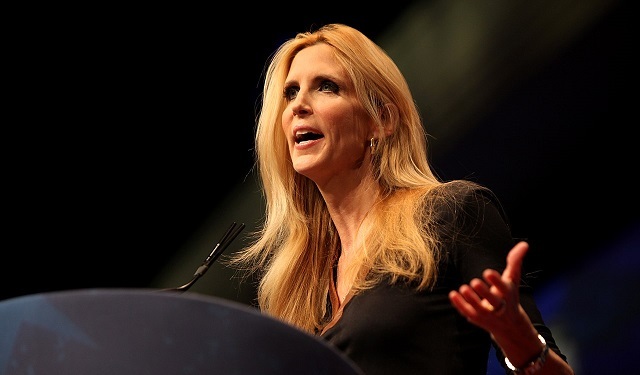 Coulter says that Trump's comments on amnesty for illegal aliens is far worse that Wolff's recent Fire and Fury book,�in which he says Trump is "worse than everybody thought." This DACA lovefest confirms a main thesis of Michael Wolff's book: When Bannon left. liberal Dems Jared, Ivanka, Cohn & Goldman Sachs took over. After agreeing with DiFi that stand-alone DACA will come FIRST, Trump's muscle memory kicks in & he cites Israel, saying NOTHING BUT A WALL WILL WORK. Nothing Michael Wolff could say about @realDonaldTrump has hurt him as much as the DACA lovefest right now. Trump's seeming promise to give DACA illegal aliens amnesty is a break from his populist campaign promises and pro-American immigration agenda, where he once said, "There will be no amnesty." It's just flat out terrible negotiating. DEFINING WALL DOWN: "Democrats and Republicans struck notes of cautious optimism after the meeting, with both sides seeming to agree that 'the wall' and 'border security' are interchangeable terms ..." https://t.co/LVUpHy1TSH Same sellout strategy Marc Short tried before. As he considers the utility of walls (and promises), @realDonaldTrump should consider that "Never Trump" was toothless, but "Former Trump" will bite. Coulter also appeared on The Larry O'Connor Show later in the day and said this is "the worst day of his presidency." Trump tweeted late Tuesday he still wants "border security," chain migration, and the diversity lottery to be part of the bill.